My posts have become infrequent due to grad school and now thesis writing (certification impacts on cacao producers’ net incomes in Côte d’Ivoire). UTZ Certified (UTZ) just released a report on cacao certification impacts (PDF) that’s very relevant to my thesis, and an example of high-bar certification impact assessment that warrants wider attention. UTZ also released a response to the study (PDF), identifying challenges/gaps, as well as positive outcomes, and stating commitments to addressing areas needing improvement. Their candor and public accountability are commendable. Overall, this is a great model for impact reporting that I’d love to see used by more certifiers, and others undertaking other interventions, agricultural or otherwise. 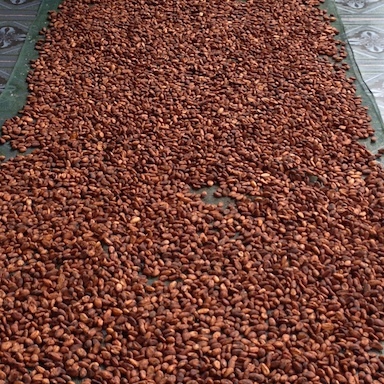 Côte d’Ivoire produces about 40% of the world’s cacao (ICCO, 2014). About 43 percent of the population lives below the poverty line (Hatløy, 2012). Cacao certification has grown rapidly, in part as a way to address a looming supply deficit, producer poverty, child labor and environmental degradation (TCC, 2012). Hershey, Mars and Ferrero have committed to sourcing 100% certified cacao, driving continued demand growth. Certification adds costs for producers, companies and consumers. Given these factors, it’s critical to ensure certification has positive returns. Having read myriad studies, including peer-reviewed articles, certifier reports and third-party evaluations, and having visited farms in numerous countries, I’m aware (as are many, many others) that certification impacts vary and aren’t unilaterally positive. Most research to date has focused on coffee, making rigorous, independent studies on cacao certification essential. UTZ commissioned LEI Wageningen UR, a research institute, to gather baseline data on UTZ certified (725) and non-certified (55) producers from 97 co-ops (89 certified), and conduct a follow up survey in 2016. Producers were drawn from across the country, and certified producers had been certified for different lengths of time. Some UTZ-certified farmers also had Rainforest Alliance (RA) certification. The goal of the research is to evaluate farmers’ knowledge and implementation of the agricultural, social and environmental practices that are included in the UTZ Code of Conduct (GAP practices); and evaluate the effects of certification yield, income and other areas. The survey aligned with UTZ’s Theory of Change, serving to test Utz’s beliefs about how it affects change. Note: As stated by the authors, since the study does not include data from the time before producers attained certification, it is not certain how certified and non-certified producers differed initially, and the observed differences cannot be attributed solely to certification. Producer knowledge of specific GAP practices differed, with knowledge being lowest for child labor, record keeping and numerous farm management practices. Thus, there’s room for improvement in training. Higher knowledge of GAP is correlated with higher productivity and higher GAP implementation overall, though not for each GAP individually. For example, post-harvest processing and quality were not necessarily higher among farmers with higher knowledge. Certified producers reported higher productivity and incomes after certification. Gender inclusion could be improved, as the majority of those directly reached by UTZ training are male (as are the majority of cacao farmers). Male farmers who are reached directly train their family members, so females are reached indirectly. The study controls for the effects of cooperative membership by including only cooperative members. Many studies fail to do so. The large sample size allows for higher-level statistical tests, higher validity of group means, and more confidence in statistically-significant group differences (albeit still affected by selection bias). The use of controls allows for an analysis of the effects of certification versus the status quo (ditto). Controls also were randomly selected, reducing bias in the results. The study uses regression models to address selection bias, a higher-level technique not seen in many public reports from certifiers. The follow up survey will allow for a “difference in difference” analysis that enables one to make more confident claims about program impacts, by comparing change over time across groups. By surveying only cooperative members, who represent about 15% of Ivorian cacao farmers (Hatløy, 2012), the study precludes conclusions about how certified producers differ from the majority of cacao farmers in the country. Report (p 49) notes several others, such as poor recall among farmers (few keep farm/finance records), farmers’ lack of clarity about certification status and length, and certification training; involvement of some controls in certification training, limited training for stakeholder interviews; and discrepancies in data provided by UTZ, co-ops and traders. Most of these are common issues across certification studies and development fieldwork more broadly. Hatløy, A., T. Kebede, P. Adeba and C. Elvis. 2012. Towards Côte d’Ivoire sustainable cocoa initiative. Fafo. International Cocoa Organization. 2014b. “Quarterly Bulletin of Cocoa Statistics: Cocoa year 2013/2014, XL (3), 9/5/14.” Accessed 9/9/14 at icco.org. Tropical Commodity Coalition. 2012. 2012 Cocoa Barometer. Author. UC Davis is running a series of profiles of graduate student research. The latest in the series focuses on four studies in the food sector. I’m humbled that it includes my thesis research on the costs and benefits of cacao certification in Côte d’ Ivoire, along with great work by a fellow Ag/Resource Econ graduate student who’s looking at migrant labor from Mexico to the U.S., and two studies looking at sustainability in grape and lima bean production. Each profile includes a short summary for a general audience, and photos. Over winter break, I completed my second Farmer-to-Farmer assignment for ACDI/VOCA, in Viet Nam. I spent three weeks in country, from 14 December 2013 to 4 January 2014. The goal of the assignment was to evaluate farmers’ decisions whether to maintain cacao (“ca cao” in Viet Nam) trees that they planted as participants in the SUCCESS Alliance/SCF program (SUstainable CoCoa Enterprise Solutions for Smallholder/Sustainable Cocoa for Farmers). SCF has facilitated farmer training (via the train the trainers methodology), access to cacao seedlings and inputs, and linkages to markets, in order to support the establishment of new cacao plantings on smallholder farms. Smallholders in the program have been dropping out at a higher rate than usual (though not a large percentage overall), and cutting down their cacao trees (or letting them die), necessitating an exploration of the underlying reasons, and ways to improve project activities and communications to promote retention of the crop, where it is profitable to do so. The project funding ends in 2014, and ACDI/VOCA wants to stem farmer attrition through that time, while equipping on-the-ground partners to maintain efforts that foster farmer retention and success. Why are farmers leaving cacao, and what information do they use to make this decision? Is leaving cacao a rational economic choice for long-term farm and household viability, or a short-term decision dictated by cash flow? What can the SCF project (or future projects) do to prevent farmers from leaving cacao in terms of a) project methodology and b) communications and messaging? To meet these objectives, I coordinated a survey of 74 farmers (58 individual, 16 in groups) in the Lam Dong and Dak Lak provinces, and interviewed key informants at the national, provincial and district levels of the Ministry of Agriculture and Rural Development (MARD); and companies such as Mars and Cargill. I also presented the results and draft recommendations to stakeholders in order to obtain feedback to revise the recommendations. Eliminating or significantly reducing subsidies is critical to develop a sustainable cacao sector, including input and service providers. Most farmers said they began to grow cacao due to external support and promotion such as training, free seedlings and fertilizer; and government promotion. In such cases, farmers may not be self-motivated to maintain, expand or market the crop; and may not be willing to purchase inputs and services at market rates, when external support ends. Input and service providers also have difficulty competing on price, leaving a gap in the private sector. Farmers who maintained their cacao overwhelmingly cited satisfactory prices and income as the reasons for doing so. Farmers who cut some or all of their cacao stated more diverse factors, including challenges obtaining sufficient water (it requires irrigation in the study areas, which adds costs), problems controlling insects, and prices that farmers found unattractive. This indicates that there is not a strong reason cacao farming cannot be successful; but addressing attrition will not be simple, because approaches must be tailored to myriad issues facing small subsets of farmers. Not all of these farmers abandoned the crop completely, indicating an opportunity to prevent further attrition through efforts informed by program outcomes and research to date. Longer-term agronomic training, including capacity building among national extension, is critical to improve retention, since cacao is a tree crop that does not bear for about three years. The program facilitated three years of farmer training, leaving them with a knowledge gap in crop management and harvest practices when trees matured. MARD extension agents provide technical assistance on a long-term basis, but had limited knowledge of cacao management given that it is a minor crop with a relatively recent uptick in interest. Training on markets could help address attrition. Several farmers cut their trees as a result of a drop in prices, and said they regretted their decision when prices rose later. Educating farmers on the lifecycle cost/benefit of cacao, and long-term price trends, would help address these issues. An improved understanding of the true profitability of cacao would also motivate farmers to invest more in maintaining and expanding their crop, increasing their output and efficiency, driving further improvements in economic outcomes. Access to affordable credit was a challenge in some areas, indicating a need to facilitate financing such as value chain finance through input provider and buyers. This summer, I had the good fortune to do another ACDI/VOCA Farmer-to-Farmer volunteer assignment. I evaluated financial record keeping, and Good Agricultural Practices (GAP) adoption and cost-benefit, among Ghanaian cocoa farmers. It was a great experience that allowed me to put my cacao sector work and academic training to good use, and get to know Ghana’s wonderful people and culture. GAP training helps farmers learn basic yet effective crop management practices to increase yield and profits, such pruning, weeding, fertilizing, pest control and the use of better germplasm. Efforts to facilitate and motivate farm financial record keeping have increased across the agricultural sector, as stakeholders seek to help farmers adopt a business mindset that helps them boost yield and profits further. Prior to the three-week stay in country, I developed a farmer survey and refined it with ACDI/VOCA’s fantastic Specialty Crops team (including Managing Director, TJ Ryan, one of my inspirations in transitioning to development). I spent my first week in Accra, Ghana finalizing the survey questions and design, interviewing ACDI/VOCA staff about Ghanaian cocoa farming and their programs; and meeting with representatives from the Ghana Cocoa Board (Cocobod), Armajaro (trader), SourceTrust (Armajaro’s development non-profit) and the World Cocoa Foundation (WCF). ACDI/VOCA staff Catherine and Prince were wonderful to work with, and quickly set up logistics for surveys in the Ashanti and Central regions. At the start of week two, I flew to Kumasi, in the Ashanti region, then rode south to the New Edubiase district. We traveled through beautiful green country and passed many colorfully dressed churchgoers, as it was Sunday. Along with Bawah, a fantastic extension agent, I surveyed farmers in three villages over a few days. These farmers had participated in training on record keeping through the WCF Cocoa Livelihoods Program (CLP), as well as ACDI/VOCA’s agricultural training. They were quite proud of their quality cocoa and record keeping efforts. After the surveys, I visited a Business Service Center in New Edubiase, established via the WFC CLP. These provide one-stop-shopping for inputs, planting material and credit—which is particularly difficult for farmers to access. On the day we visited, farmers were lined up to purchase fertilizer, which had just become available and was months late in arriving. Cocoa farming is no easy task as is, and such logistical challenges compound that. After a few days in New Edubiase, I rode further south to Assin Foso, in the Central Region. There, I met with Armajaro/SourceTrust staff to finalize survey plans for the district. Early the next morning, I set out for village interviews with Edmund, a recent high-school graduate who would translate in the local language. We interviewed farmers in three villages over two days. Edmund had an excellent manner with the farmers, and was a quick study on the survey questions and cacao farming, making him an incredible asset. The farmers in this district had not received the WCF CLP record keeping training, and did not have access to a BSC, making farming more challenging for them. With the surveys completed (56 in all), the weekend arrived…giving me ample time for data entry, analysis, report writing and materials development. I also enjoyed runs, walks through town, and ample amounts of kenkey, red red and other goods from wonderful food vendors. After a few days of computer work in New Edubiase, I rode back to Accra with ACDI/VOCA’s driver, who imparted a wealth of information about the country. We passed a refugee camp and drive through Cape Coast, where an old slave trade castle stands as a stark reminder of the slave trade. In week three, I completed my analyses, report draft and materials; and presented these to a cross-sector stakeholder group in Accra. Overall, the results indicated that farmers had a high interest in record keeping and adopted it if they received training, but did so at varying levels if trained due to varied literacy and numeracy skills. The WCF CLP materials are very comprehensive, and a model for other sectors, though producers seem to need secondary schooling to understand and use them. In my recommendations, I included ways to address this such as pairing up farmers with different skill levels. The WCF CLP materials also include only an annual budget form, and recalling costs and sales over this time frame can be challenging for anyone. To address this, I created a monthly cost-income tracking log and a year-by-month budget sheet for farmers. Regarding GAP implementation and cost-benefit, farmers demonstrated high adoption with variation in extent (e.g., amount of fertilizer used, frequency of pesticide spraying). Cost-benefit analyses indicated positive returns. Cocobod’s Cocoa Manual has a Net Present Value sheet that served as the basis for the GAP cost-benefit/ROI tool (spreadsheet). Overall, this assignment was a fabulous experience, and I hope it will be of some benefit for the farmers and ACDI/VOCA’s programs. Many thanks to all the farmers, translators, ACDI/VOCA staff, and partners for incredible assistance and information. Ghana is terrific —I highly recommend a visit, and plan to return to see and get to know more of it. Ghanaians were all very friendly, and I enjoyed seeing bit of my surroundings during morning runs. A summary of the research is below, with a longer proposal attached. Identify producer attributes that affect net income, and determine whether certified and non-certified producers differ significantly across these attributes, to quantify the relative effects of certification and other factors on net income. If you’ve ever wondered about the market forces that get cacao from the farm to your chocolate bar, confection, beverage, etc… you might enjoy a short paper I wrote for my microeconomics course. It’s focused on oligopolies across the supply chain, from producer countries to brands. The introduction is below, with a link to the full paper. As consumers snack on a Hershey bar or M&M’s, they’re probably not musing over how market powers in cacao production, processing-purchasing-exporting and manufacturing meet in the making of their favorite treat. Yet, oligpolists rule across the value chain—seeking to sway the market individually and collectively. They also counterbalance each other, tempering the effects that one level of the value chain has over another. The following paper unwraps this issue by exploring oligopolies in the mainstream cocoa and chocolate industry since the early 2000’s. The discussion begins with an overview of the supply chain for context. It proceeds to a discussion of oligopolists at each level, characterizing the magnitude and locus of their power, and individual and joint actions designed to increase influence. It concludes with an analysis of supply, demand and prices to show how each level counters the other, yielding competitive market outcomes. I.e., It excludes the specialty sector, with differentiated varietals that sell for price premiums. Haven’t blogged in a while, as graduate school (M.S. in International Agricultural Development, UC Davis, with plans to add a second M.S in Agricultural and Resource Economics) has been pretty time consuming. For an assignment in a agronomic systems assessment course this spring, we had to undertake an evaluation of the System of Rice Intensification (SRI, also used for other crops), using peer-reviewed scientific literature. SRI has been the subject of a growing number of popular media and NGO articles, which are generally slanted toward the pro or con side, and don’t reference more than one or two peer- reviewed studies, if they reference them at all. It was a valuable assignment that seemed like a balanced complement to mainstream media and NGO reports, and a good reminder about why we need to refer to peer-reviewed research (using several diverse pieces) to evaluate such reports rather than taking them at face value. It’s attached as a PDF, with the description of the assignment below for reference.